Creative Diagnostics currently provide tetrodotoxin antigen, antibodies and ELISA kit for the determination of TTX levels, which could be used in various applications. Tetrodotoxin (TTX) is a potent neurotoxin. Its name derives from Tetraodontiformes including pufferfish, porcupinefish, ocean sunfish, and triggerfish; several of these species carry the toxin. Although tetrodotoxin was discovered in some fish and found in several other aquatic animals. The actual source of tetrodotoxin, however, is not the pufferfish itself – or blue-ringed octopus, newts, and various worms and crabs that also contain the paralytic poison. 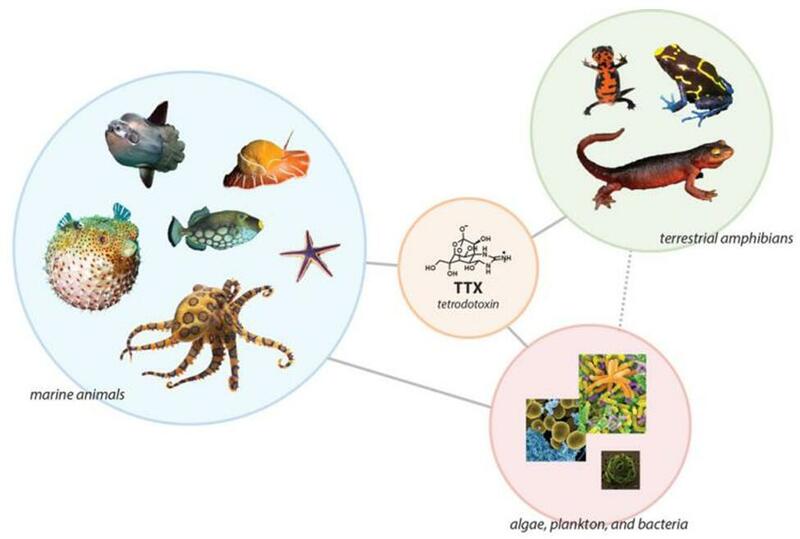 Rather, tetrodotoxin is likely produced by certain infecting or symbiotic bacteria like Pseudoalteromonas, Pseudomonas, and Vibrio as well as other species found in the animals. The molecule comprises of a +vely charged Guanidinium group which is made up of three atoms of nitrogen and a Pyrimidine ring along with additional fused ring systems. The first case of poisoning of Tetrodotoxin comes from the logs of Captain James Cook in 1774 who observed his crew eating puffer fish and feeding the remains to pigs. Soon after, the crew began to feel numbness and respiratory difficulties while the pigs died the very next morning. The name of the toxin was given in 1909 by Dr Yoshizumi Tahara, a scientist from Japan. Tetrodotoxin is a sodium channel blocker. 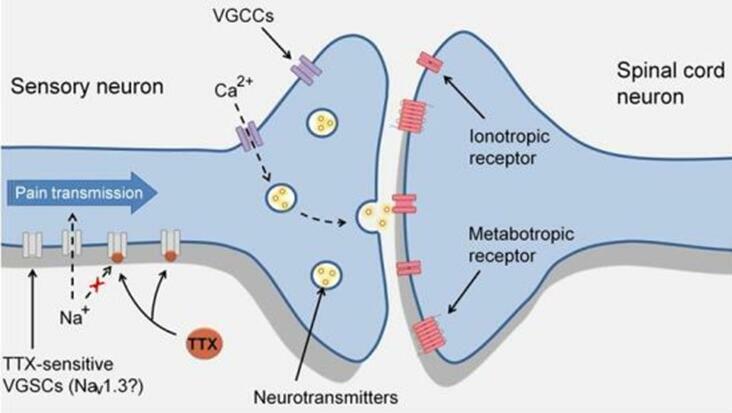 It inhibits the firing of action potentials in neurons by binding to the voltage-gated sodium channels in nerve cell membranes and blocking the passage of sodium ions (responsible for the rising phase of an action potential) into the neuron. TTX is extremely toxic. The toxin can enter the body of a victim by ingestion, injection, or inhalation, or through abraded skin. The Material Safety Data Sheet for tetrodotoxin lists the oral median lethal dose (LD50) for mice as 334 μg per kg. Assuming the lethal dose for humans is similar, 25 milligrams (0.000881 oz) of tetrodotoxin would be expected to kill a 75 kg (170 lb) person. The amount needed to reach a lethal dose by injection is much smaller, 8 μg per kg, or a little over one-half milligram (0.00002 oz) to kill a 75 kg (170 lb) person. There are several symptoms and effects of Tetrodotoxin. After a person eats a poisonous Puffer fish, the first symptom is a bit of numbness felt on the lips and tongue within 20 minutes to 3 hours. It is followed by escalating paresthesia in the face and extremities which may be followed by some feelings of lightness. The effects are in form of headache, diarrhea, epigastria pain and vomiting. Sometimes the person can feel difficulty to walk. The second stage is increasing paralysis where the victim is unable to move and experience difficulty in breathing. Speech too is affected and the victim exhibits signs of dyspnea, hypotension and cyanosis. Within 4 to 6 hours the victim dies.